“The more things change, the more they stay the same.” These words were once uttered by the fictional character Snake Plissken just before setting out yet another conscripted suicide mission. Oddly enough, Snake was right and those words resonate more with this particular review than any other. It would seem that, in making the most of their existing tooling, Hasbro decided that it was to release yet another version of the traditional Cobra Commander. 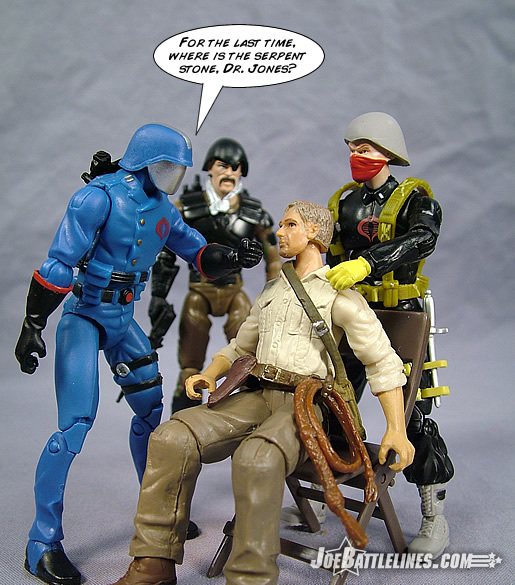 Debuting in the first wave, this mold has seen quite a bit of use – from the first Cobra five pack, to the Cobra Legions boxed set, to the 2007 wave 4 single carded version, and even as part of the Toys R Us exclusive Cobra Command three pack. (A review of that is coming… really!) Yet, with four previous releases under their belt, the folks at the home office in Pawtucket decided to take one more stab at “the most dangerous man alive”. How successful this latest update is will vary from collector to collector. Zzzzzzz…. Do I have to? You could at least wake me up when there’s something interesting to say. Haven’t we gotten this almost exact same figure 3 times already? 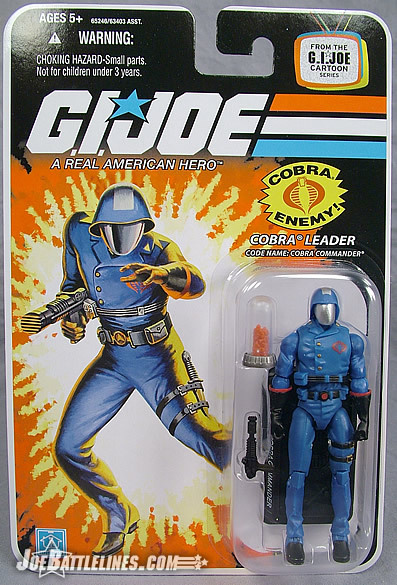 The original COBRA Commander in the 5-pack was great, but yeah, it was missing some key components to make it the “be all, end all” COBRA Commander. But we did get a very nice cartoon accurate Commander in the Senior Officers 3-Pack from Toys “R” Us. This figure looks almost exactly the same, with some minor cosmetic changes and different belt colors. So really we already got a pretty nice cartoon default Commander, and there aren’t many differences here that make this one more worthwhile than the other. 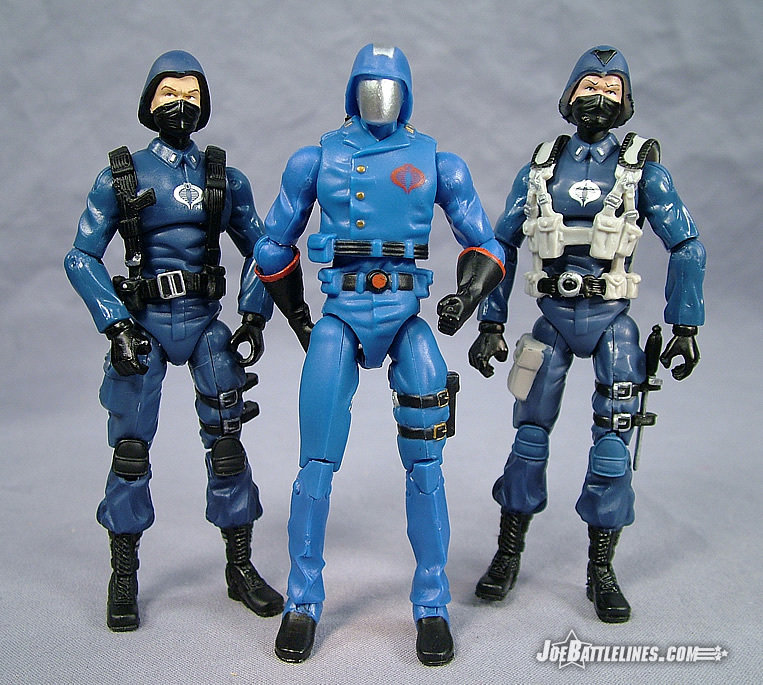 If the figure of Cobra Commander has one key selling point in addition to the darker shade of blue used for his uniform, it’s found in the included accessory. 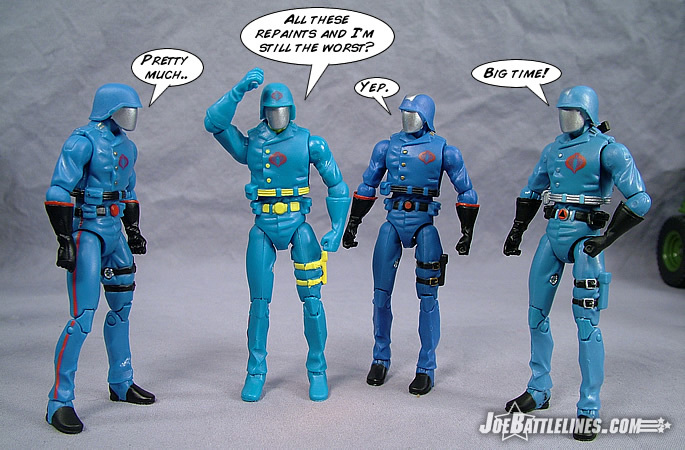 Harkening back to the debut GIJoe mini-series and the forthcoming cartoon packs, Cobra Commander is packaged with a set of the rare radioactive crystals that made up the key ingredients to powering the matter transportation device. While the prop isn’t all that elaborate—just a clear plastic dome over a gray circular base with some sculpted red crystals stashed inside, it’s enough to kick start the nostalgia in this particular fan boy. I can remember running home from school (literally) in order to only miss five minutes of the debut mini-series on WGN. 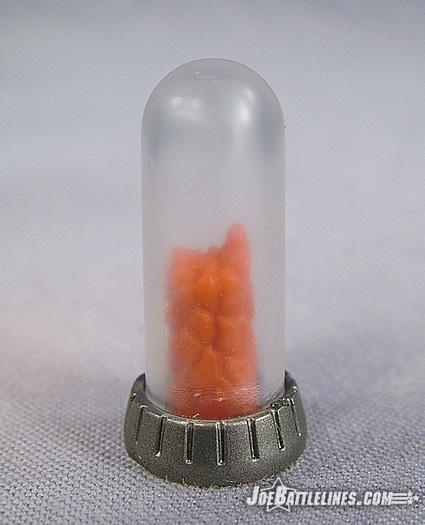 Plus, with the forthcoming “build-a-maguffin” MASS Device replica coming in the battle packs, this particular accessory is a must-have for me. There’s not much more to say except that cartoon fans are going to want to snag this version of the Commander for the crystals alone. 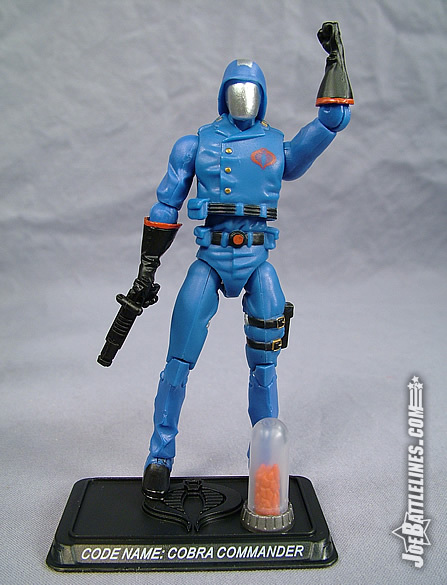 Honestly, if you’ve already purchased the other previously-released versions of Cobra Commander and are looking to save some much needed cash this is one of the figures to skip in this wave. 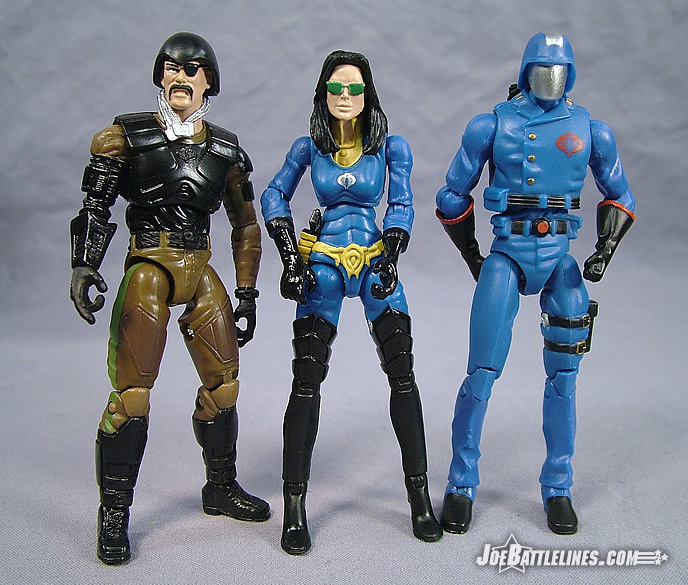 However, if you’re a cartoon fan and haven’t already snagged a Cobra Commander figure then this is the version to grab. Snake’s quote about “the more things change, the more they stay the same” holds true as this is essentially the same version of the figure that debuted last year. Honestly, if it weren’t for the crystal prop and the fact that I had to write this review or Justin wouldn’t give me back my Xbox 360, I’d have skipped this figure entire. (Now I’ve got to find something interesting to say about the one in the Cobra Command three-pack!) I’ll pass the keyboard over to my erudite colleague for his closing remarks. The crystals prop is great! I love it, and I love how it ties in with the MASS Device Battle Pack, I think that’s a great idea. But is it worth seven bucks? 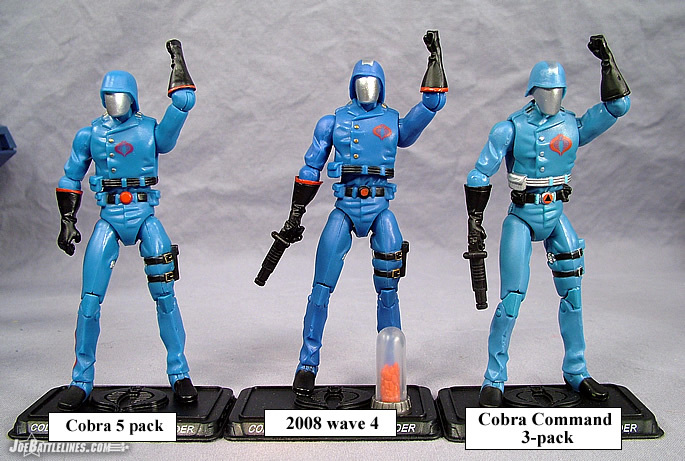 I mean the figure itself is remarkably similar to three other COBRA Commanders released previously. Actually four others if you consider the fact that COBRA Commander was released in Single Pack form last year as well as the 5-pack. Not enough differences to warrant another seven dollar investment, but many of the cartoon fans will snap him up for the crystals. And yeah, I suppose if you don’t want to spend $14 on the Senior Officer 3-Pack, then this makes a good replacement for that, but besides that, there isn’t much here to recommend.